Tales of Symphonia is jam packed with fun and lovable characters, each with their unique quirks to help them stand out from the crowd. Sheena was always one of my favorites when playing it on the GameCube back in the day. Why? Because who doesn't love sassy ninja girls? That's why. Granted, a cute purple outfit and magical cards are not the extent of her character. Sheena does not let others push her around or take advantage of her, more often than not, leading to comical situations with men who find her attractive. Despite her cold attitude and tragic isolated path, she is more than eager to make friends and stops at nothing to do what is right. Again, Tales of Symphonia's characters are not popular for their depth, but rather because of their charming simplicity. In this day and age when games suffer from being overwritten by committees and characters are complex beyond believability, it's nice to see solidly defined characters overcome a single demon which holds them back from being complete. Simple character archs and traditional storytelling are too hard to find these days, and you won't find a better example of them than in Sheena and her friends. Yes, she is also a lot of fun to use in battle. Her traditional ninja seals give her melee attacks an extra boost of damage with elemental power, and she also acts as the summoner of the group, calling massive beasts into battle to rain hell on the team's enemies. 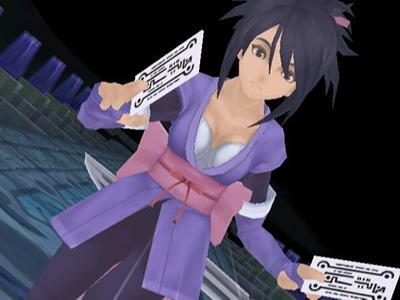 Check out Sheena and all of her friends in Tales of Symphonia Chronicles when it releases for the PlayStation 3 next year.